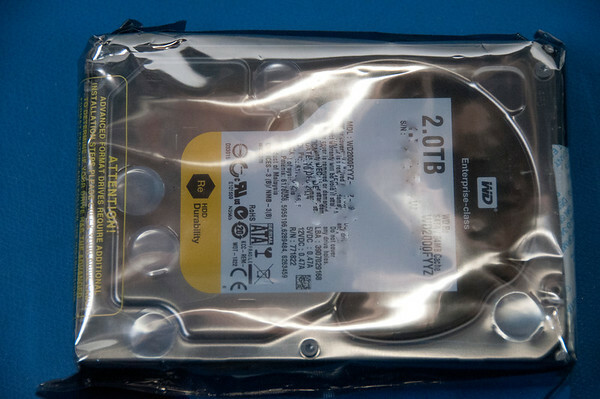 The Western Digital WD 2 TB Hard Drive (WD2000FYYZ) is a technological marvel. Modern hard disks records data onto a disk coated with a magnet material spinning at 7200 rpms. A read-write head records data by changing the direction of magnetization on magnetic domains in the magnetic material on the disk platter. The magnetization is the North-South direction of the magnetic field recorded onto the disk. North-South pointing magnetic field (up) might represent a 1 and a South-North (Down) pointing magnetic field might represent a 0, for example. The bottom of Figure 1 shows this Perpendicular Magnetic Recording (PMR) technique. PMR increases the bit density to permit storage of 1-4 TB of data for the RE series of drives. Western digital has been using PMR since 2006 for 2.5 inch drive and then in 2009 for 2 TB drives for the first time. The head flies very close to the platter on a cushion of air, and the height is controlled dynamically on the RE drive for better reliability. This flying height can be as small as 3 nm in modern hard drives. Figure 2 shows a photograph the read-write head actuated over the disk platter. The head contains a coil to magnetize domains or bits during write operations, and a Giant MagnetoResistive (GMR) read head to detect the magnetization direction during read operations. Figure 3 shows an illustration of the head structure and the GMR read head and is also known as a spin valve sensor. 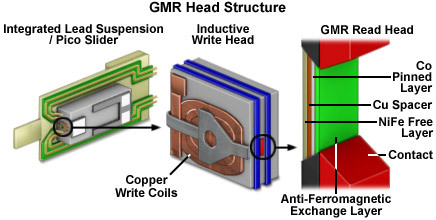 The GMR read head contains an antiferromagnetic layer (NiO, PtMn, or IrMn), a pinned ferromagnetic layer (Co), a non-magnetic layer (Cu), and a free magnetic layer (NiFe). 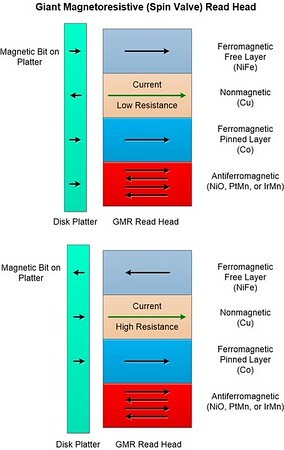 The antiferromagnetic layer fixes or pins the magnetization direction in ferromagnetic layer (Co) next to it so that the pinned layer does not change in the presence of an external magnetic field from a magnetic bit on the platter. The magnetization direction of the free layer (NiFe) changes with the direction of the magnetization of the magnetic bit on the platter (magnetic bit). When the magnetization direction of the pinned layer and the free layer are pointing in the same direction, then the current flowing in the nonmagnetic copper layer encounters a low resistance (see Figure 4). When the magnetization direction of the pinned layer and free layer are pointing in opposite directions, then the current in the nonmagnetic copper layer encounters a high resistance. This is a quantum mechanical affect. The current in the copper layer is a flow of electrons that have variety of magnetization directions. When the magnetization direction of the pinned and free layers are pointing in the same direction, then electrons with that same magnetization direction as the two layers are scattered less often and experience lower resistance. When the magnetization directions of the pinned and free layers are pointing in opposite direction, then more electrons are scattered and experience a high resistance. 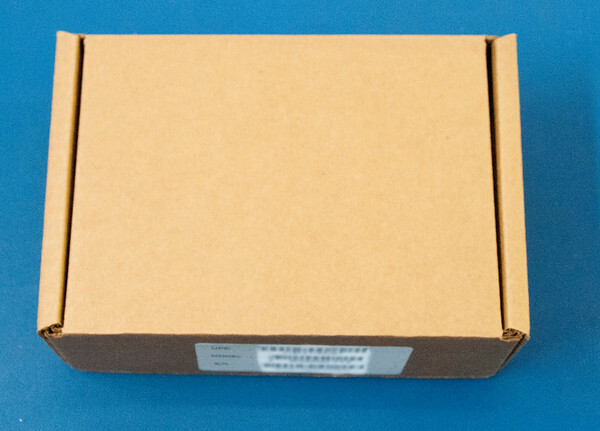 Figure 5 shows the front of the box that the bare drive was shipped in. Figure 6 shows the front of the drive. Figure 7 shows the back of the drive. 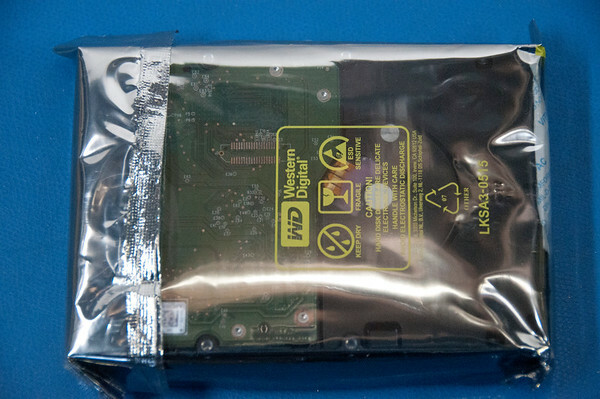 Figure 8 shows the unboxing video of the WD RE 2 TB Enterprise Hard Drive. The WD RE is an enterprise drive designed for reliability and high levels of read-write access per year (550 TB/year). The reliability is achieved by design and by extended thermal burn-in tests. I selected this drive for its performance and reliability in the hope that it will last way more than three years. I’ve had a batch of enterprise grade disks from Seagate that failed in that period of time. The datasheet indicates that the hard disk has a maximum transfer rate of 164 MB/s. The Samsung Magician tool indicated a sequential read-write rate of between 66 to 194 MB/s which exceeds the maximum transfer rate spec of the drive. Perhaps, some buffering is occurring to give better throughput transfer rates. The system drive Magician benchmarks are shown in Table 1. I use the 2 TB WD RE drive for user files and it has been performing well. I’ve been pleased with this drive and I’m looking forward to working with it for a long time. It contains some really neat technologies but the details of the technology are hard to determine. Western Digital does not post much about the technology in their drives for some reason. I wish they would post some white papers on their drive technology.